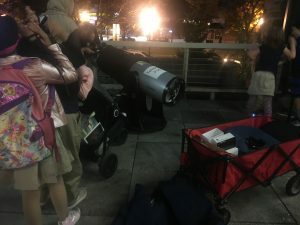 At the beginning of November John Maple, an educator from Baltimore’s Space Telescope Science Institute, came to the Roland Park Branch to host a Star Party. Mr. Maple talked to an audience of children, teenagers, and adults about STScI’s work with the Hubble Telescope. 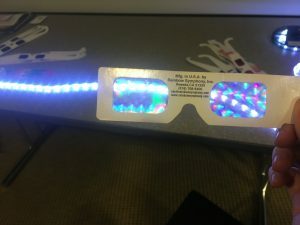 He used LEDs and special glasses to show everybody how scientists use light and color to explore the universe. Then, after eating dinner, we all went up to the library’s terrace to look at the sky with a telescope. It was a cloudy night, but everybody was excited to see the top of Roland Park Elementary/Middle School’s bell tower through the telescope. This program was one of many programs at Enoch Pratt ran as part of the One Book Baltimore initiative. Programs related to restoring peace, anti-violence and the One Book initiative is scheduled at various Pratt locations across the city. The grand finale will be a conversation with author Nic Stone, December 12, 2018, 6 p.m. at the Northwood Branch. Ready for another great set of reviews from Adult Summer Challenge participants? Here you go! 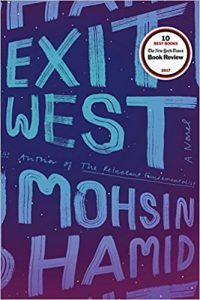 Himani S. on Exit West by Mohsin Hamid: A great story of war and refugees and immigration. The author uses magical realism to give us the multitude of issues that countries are grappling with when refugees seek safety and life. I want to read more written by this author. Terse compact sentences that were nevertheless poetic in delivery. James K. on The Chilbury Ladies’ Choir by Jennifer Ryan: This delightful novel is perfect for summer reading. Its depiction of life in a village in Kent during World War II is poignant and never dull. The narrative takes the form of journal entries and letters written by the various characters and it works well to show the perspectives and motivations of each character. It is not overly sweet and sentimental—there are plenty of bad actors. All the truly irredeemable characters are men, interestingly. The musical theme of this book centers around the classic English hymns that the ladies’ choir sings in competitions and at special events throughout the book. Anglican hymnody has been an important part of my own spiritual journey, so I identified closely with the healing power of this particular type of music. I highly recommend this book. 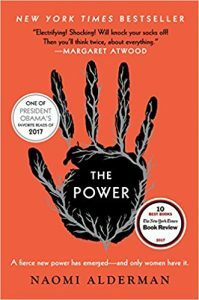 Mike K. on The Power by Naomi Alderman: I loved this book which imagines what would happen if women developed the power to electrocute others. The story is engaging enough, but it is also thought-provoking—insinuating a theory of gender disparity. Highly recommend! Jacki G. on Anything is Possible by Elizabeth Strout: A whirlwind tale about a small town in Illinois. I think anyone from a small town can relate to something in this tale. Terrific writing. 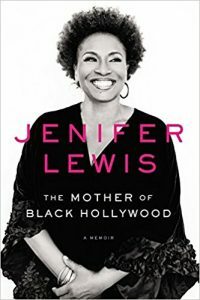 Theresa C. on The Mother of Black Hollywood by Jenifer Lewis: Can’t help but love Jenifer Lewis. To learn all she endured to get to where she is puts her in the “legends” category. This book is so precise and fast-paced. Couldn’t put it down. Thank you, thank you, thank you. Lauren R. on Situation Momedy by Jenna Von Oy: Fun, frivolous read. I like Jenna’s down-to-earth attitude and silly storytelling style. This book is an antidote to so many parenting books; it’s memoir rather than instructional. Enjoy it as you do mamahood. Join the fun! For a chance to win fabulous prizes in the Adult Summer Challenge, create a free Beanstack account and log each book you finish between June 13 and August 15. 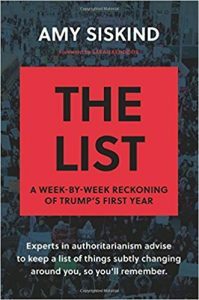 Gordon B. on The List by Amy B. Siskind: Siskind was told that she needed to make a list of everything that she felt was out of the democratic norm for this administration, otherwise, she would not realize what she had lost when the time finally came to realize that her democracy was gone forever. She began recording and was amazed to see how many words and actions the Trump regime transgressed on. She was also surprised to observe how the actions and words mounted over the weeks that came. Many weeks were jammed with events that could have been scarcely expected when she began making “the list.” Carefully done so that judgment only is implied, this list is a house of horrors for those who want the Trump influence to be very light. 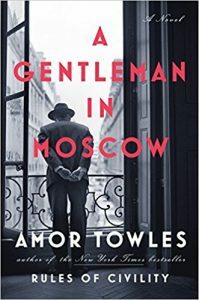 Melina T. on A Gentleman in Moscow by Amor Towles: First of all, don’t be intimidated by the length/size of the book – it’s big but such a delightful read. The book takes place a couple of years after the Russian Revolution–the Count Rostov, who lives at the famous Metropol Hotel, is sentenced to life imprisonment within the hotel and declared a “former person.” How can a book so long be told just from within the confines of a six-story building? Towles does an amazing job at making the setting appear larger than life and his characters are so well developed and the hotel becomes as much a character in the novel as any of the human ones. This is a beautifully written book with so many lovely nuggets (too many to list here) and a wistfulness regarding how to comport oneself with class and graciousness. If you don’t fall in love with the Count and the many different characters that make up his world, well then…. Ellen L. on Come Sundown by Nora Roberts: Nora Roberts is a master storyteller of romantic suspense. This book takes place mostly on a family-owned ranch and resort in Montana and has superb dialogue. The plot revolves around a family member who has been missing for 25 years—it has a great surprise ending! Nancy G. on The Kindness Cure by Tara Cousineau: Super-great, useful suggestions for ways to approach a stressed-out, fearful world with compassion and empathy. Great application of neuroscience information. 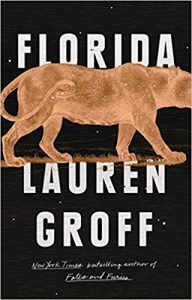 Cornelia B. on Florida by Lauren Groff: Spooky, unsettling, weird and internal, these stories probe the psyches and swampy landscapes of America’s weirdest state. 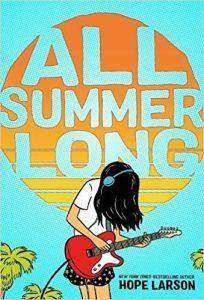 This was perhaps the most anticipated book of the summer on lists all over the Internet! 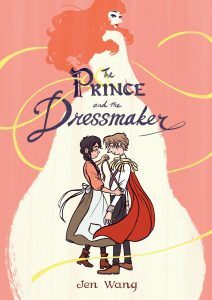 Jana G. on The Prince and the Dressmaker by Jen Wang: This was a lovely book and super-quick read. I appreciated that the underlying story was one of acceptance and understanding, though felt the ending a bit contrived (a kids’ fairy tale for sure). the images were wonderful and the story heartfelt. I will likely reread the book again in the future. James R. on The Woman in the Window by A. J. Finn: Pretty good book with lots of references to Hitchcock and other old movies. I think this is one that will actually be better as a movie. 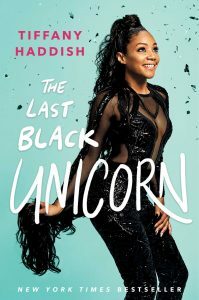 Noelani L. on The Last Black Unicorn by Tiffany Haddish: Hilarious and heartfelt! Audiobook read by the author is excellent. Enjoyed this on my commute to and from work. Leslie J. on The Sleepwalker by Chris Bohjalian: Love his books. Can’t put them down. This one had me up late into the night trying to figure out who done it. Laura M. on Lincoln in the Bardo by George Saunders: The book is written in a fascinating style of quotes from fictional characters and historical accounts of Willie Lincoln’s illness, and imagined experience in the graveyard neighborhood, during Abraham Lincoln’s presidential term. It’s emotional, touching, and imaginative. Quite funny in parts. If you liked Neil Gaiman’s The Graveyard Book, you will probably like Lincoln in the Bardo. 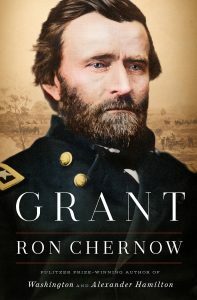 Robert B. on Grant by Ron Chernow: Most of us think of Ulysses Simpson Grant as a great general but a poor president. Ron Chernow’s tour-de-force biography casts Grant in a completely different mold, emphasizing his fight against the Ku Klux Klan in the post-Civil War South as well as his determined support for African American rights. Chernow also enumerates those qualities of Grant that made him the first modern general to emerge from the Civil War. This is a large book but definitely worth the time and effort it takes to make your way through it. Holly T. on Cake Wrecks: When Professional Cakes Go Hilariously Wrong and Wreck the Halls: Cake Wrecks Gets “Festive” by Jen Yates: […]Cake Wrecks is an active blog in which people submit pictures of professionally made confections that are just freakin’ WRONG. The books are the best of the worst of these submissions. Laughable spelling and grammar, literal interpretations of instructions, and questionable icing choices are among some of the travesties you’ll find, and they’re made even more amusing by the author’s commentary. 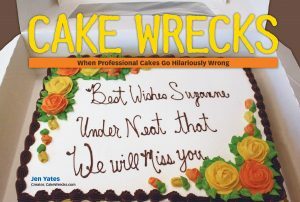 The way the world is right now, we could all do with some laughter, and the Cake Wrecks books deliver. Lakeisha H. on Any Known Blood by Lawrence Hill : […]Walking the streets that I’m familiar with in this book was a comfort and joy. The main character finds not only his personal story but the very deep and historically valid and important story of African Americans in Baltimore. What is wonderful is Baltimore becomes a character in the book. It’s not often you get to read about Baltimore in any other capacity other than crime and violence. The glory of Uptown, the impact of the A.M.E., the beauty of Charles Village, and the people of Baltimore are showcased in this book that could be considered a historical fiction. Extremely worth reading. 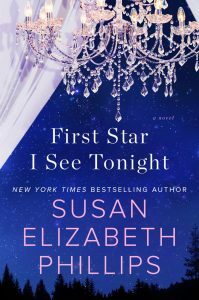 Tammra F. on First Star I See Tonight by Susan Elizabeth Phillips: Cooper and Piper made for a very interesting storyline. Piper was a treat to read about. She reminded me of a little bit of myself. She seems to think out loud and it makes for a very funny and interesting read. Cooper is just wonderful and I love that he doesn’t give up on Piper and seems to understand her better than she understands herself. 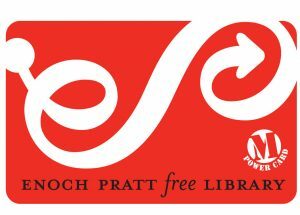 As students are hitting the books, there’s one thing you can arm them with for success: a Pratt Library card. Did you know there are all different kinds? FIRST CARD: For children six and under, the First Card is fine-free. 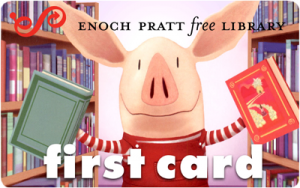 Featuring popular Olivia the Pig, the First Card allows you to bring home enough books to keep your littlest readers entertained until your next library trip. CHILDREN & TEEN CARDS: For ages 7-17, the children and teen cards enjoy reduced late fees of just 10 cents a day. TEACHER CARD: Baltimore City School educators and registered home school parents can check out 30 items that can circulate for 6 weeks and be renewed once.